It has been a month since I started my metaphorical road trip. Here’s what has been happening, divided into the RAW NEWS categories that I have been using since last November. I read eleven books this month: 4 nonfiction, 1 memoir, and 6 novels. The four nonfiction were all related to my road trip themes. Of them, I really enjoyed The Great Work of Your Life by Stephen Cope. I learned of this book from a review by Kathy at SmartLiving365. Thanks, Kathy. The memoir served as a cautionary tale. The New Old Me: My Late-Life Reinvention by Meredith Maran should have been right up my alley, but her neediness and whining were off-putting. Note to self: If ever writing a memoir, find a way to share tough times and personal idiosyncrasies without making readers want to smack me. In fiction, I enjoyed Hausfrau by Jill Alexander Essbaum, and A Man Called Ove by Fredrik Backman. Each requires its own box of tissues. I made two collages this month, one of them based on a dream where a huge black dog was lunging at me. I called the collage Fear-ocious. My inner critic is a duck whose relentless quacking about my faults makes me cranky and crazy. I made a piece about her this month too. The idea is that I’m supposed to exorcise her from my mind by ripping her to shreds or scribbling over her face. This may be a problem – she’s awfully cute. Working through Julia Cameron’s book, It’s Never Too Late to Begin Again is a major focus of my metaphorical road trip. If I were using the book as intended, I’d be finished chapter five and would have answered questions about the first twenty-five years of my life. Instead, I’m still on chapter three and have stalled out at age twelve. I’m okay with the change of plans, and with the fact that my two month metaphorical road trip might still be going strong at Christmas. Rather than just answering Cameron’s questions, I’m doing a full life review. This involves digging through journals, school records and photographs to recall and write every memory I can summon for each year of my life. The more I dig, the more I remember and the more I can write. I don’t have any plans for the material. Right now I’m just accumulating. The process is simultaneously fun and emotionally exhausting. I don’t work on it every day. When I first burned out, my naturopathic doctor told me it would take three years before my body recognized that it was no longer under stress and allowed me to lose weight. It looks like he was right. I have been retired for three years and in the last two months I’ve dropped almost sixteen pounds. My obsession with perfection really needs to be replaced with some moment to moment mindfulness. 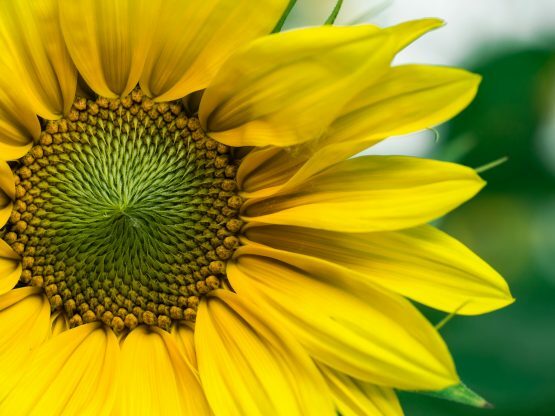 The province of Ontario and, indeed, much of Canada and the United States experienced a major heatwave for most of July. That certainly affected energy levels and impacted both quality of sleep and time outside with the dogs. It hasn’t been a great month for energy levels, however, weekly early morning walks with a friend have been terrific and I’m still loving Pilates Reformer training. There have been two bonuses to all of this heat. One is that I haven’t had to cut the grass very often. The other is that I wasn’t outside when this black bear ambled up from the forest at the back of my property and wandered around my driveway for a few minutes. I was happy to watch and admire him/her (I didn’t get close enough to check) from my library window. A daily meditation practice is part of my metaphorical road trip. My practice includes fifteen minutes of meditation (up from ten minutes at the beginning of the month) followed by reading something inspirational or philosophical and then a bit of journaling about whatever I’ve read. I’ve been hit and miss with meditation for years. I’ll get into it for a while, usually through one of the guided meditation series offered by Deepak Choprah and Oprah Winfrey or Tara Brach. Then when the series is over, I’ll ignore meditation for several months. 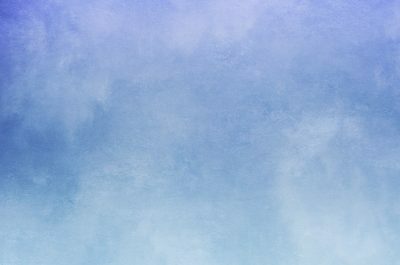 This time, I’m determined to stick with it so I’ve made a list of seven different forms of meditation that will keep me from getting bored. I’ll share my list in a future post. I’ve used mantra meditation throughout July. This involves repetition of a word, phrase or sound, over and over again. Or you can repeatedly envision an image, such as a ball of light near your heart. I made a list of my favourite Sanskrit mantras and use them. Two that I’ve used a lot are ‘Ananda Hum’ which means “I am pure bliss” and ‘Siddho Hum’ meaning “I am perfect and complete as I am.” When a mantra is short, as these two are, you can easily synchronize them to your breath, mentally saying the words on each inhale and exhale. Friends have been central to my self-care this month. There’s the friend I enjoy breakfast and a walk with every week. And the one in another province that I talk and laugh with on the phone most weeks. And then there’s the wonderful opportunity I had to spend forty-eight hours with two friends I’d met only through their blogs and as members of the Profound Journey tribe. 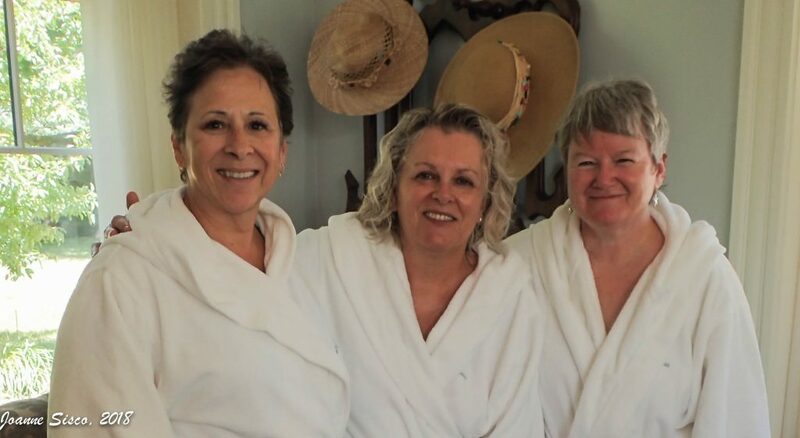 Joanne (my life lived full), Deb (the widow badass) and I thoroughly enjoyed our day of pampering at the spa — almost as much as we enjoyed the opportunity to talk and talk and talk. I didn’t realise you were one of the cyber friends Deb was spa-daying with. I hope you all had a lovely, fun, relaxing day. As I’m currently working ugh hours under eek levels of stress I’m very jealous! I hope you enjoy your time away from your blog and do what really matters to you. I have decided NOT to proceed with my PhD because it was stressing me out! I’d rather focus on my art (beyondbagsfabricstudio.com) and my new grandson. All the best! Sorry to be so late in replying, Kelly. And good for you that you’re focusing on your art. You are living your own advice about doing what matters most to you, and that is inspiring. Congrats on the new grandson! You’ve certainly had a full and rich month! Congratulations on the weight loss and you look great. This is not one of those superficial compliments. Truly – you have a light shining from your face and a wonderful wild energy that isn’t quite tamed. I draw a lot of inspiration from your RAW NEWS and metaphorical road trip. As we’ve talked about, our words and actions leave ripples behind us and affect others. A Man Called Ov was a great example of that. I loved that book. I laughed and cried throughout it. You are definitely one of those influencers in mine. Since our conversations last week, I too have started to plan changes – starting with beginning to answer the 75 not-so-scary, slightly-scary, and very-scary questions you have posed. I thought it was a great place to start, looking for insight into the next chapter ahead. Remember Karen, it’s not about perfection … it’s about excellence. 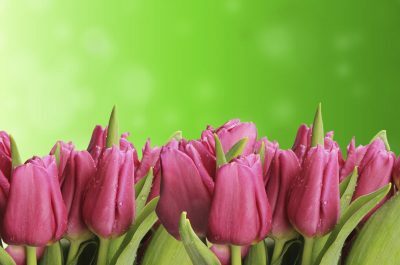 Excellence recognizes the need for continuous growth and development – a concept which you’ve clearly embraced. Ah, Joanne, you’ve made my day, week, month. Thanks so much for everything you’ve written here, and for everything you said when we were together. We will enjoy a long friendship. That’s not a prediction, it’s a certainty. How wonderful to meet with some other bloggers IRL Karen. I had coffee with Jo from Lifestyle Fifty this week and we connect like we’ve known each other for years (rather than for the one other time we met for a chat). Blogging seems to shortcut us from acquaintances to friends in no time at all. I also smiled at your bear wandering past – we have the occasional kangaroo that hops by through the wetlands opposite our house – it always gives me a happy moment when I see one. I’m really glad you’ve got Jo living in your neck of the woods. Not only does blogging turn us from acquaintances to friends, but it’s such a relief to be able to talk with others who know exactly what blogging is like, isn’t it. People who don’t do it try to understand, but they don’t really get it. Bears can be a bit unpredictable and dangerous. I think I heard that about kangaroos too? However, from our windows it’s a great thing. Oh, how I can relate to your struggle with perfectionism, Karen. The fact that your personification with this part of you was too cute to destroy gave me the thought that we need to embrace all of ourselves – even the parts that need improvement or overhaul. I must check out some of the books your read, though will skip the whiny memoir. 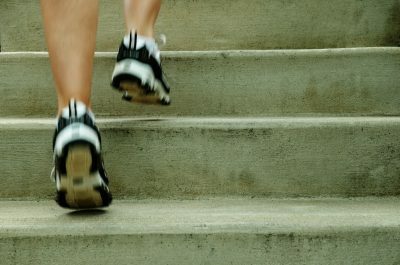 I’m very slow getting through Julia Cameron’s steps too. I had not riffled through old scrapbooks or memorabilia and now wish I had. I’m sure I’ll be repeating it over and over. It’s that kind of a program. Meditation is not part of my daily life either, though I do take quiet time each morning. I love that you met two blogging friends for a spa day! I wish I could have a day with you. What a treasure you are in my life! The last few days my meditation has been quiet time. I’m kind of thinking that’s perfectly good with me, at least for right now. Someday we will have a day together, Molly. I have to wait until your president leaves office (it’s the line I’ve drawn in the sand-to not travel to the U.S. until he’s gone) but then I’ll be happy to make a trip to Maine. You haven’t mentioned your concussion in your last couple of posts. I hope that you are continuing to make steady progress. It sounds like you had a wonderful, enriching month! I am in awe of all of your accomplishments, in so many different directions. Eleven books! Plus time for art, writing, and self-care! Good job, Karen! Thanks, Cindy! And I feel the same about you and all you do. I don’t have a full-time job to manage, or getting ready for gallery shows or, or, or… You’re amazing! What an awesome month! Your ability to analyze it, wrap it all up, and present it all with such clarity, speaks to your insight into your goals for the future. Your road trip seems to be going splendidly! Thanks, Heather. It really has been a good month. I’ve been thinking about you a lot. You mentioned a couple of weeks ago that you’ve got two family members in medical difficulty right now. I hope that situation has improved. I’m sure you’re more than ready for one of your wonderful retreat times. I hope you’ll have the opportunity to embrace one soon. I’m so very, very sorry. You are being asked to bear too much. If it helps you to talk and you need a listening, caring ear that belongs to someone you don’t know in real life, please consider me. You can write to my email karen@profoundjourney.com anytime, or let me know you’d like to speak and I can call you. I have a long distance plan that covers North America. Glad you enjoyed A Man Called Ove. I loved it and laughed out loud in several places. I just finised Britt Marie by the same author which is similar in many ways only with a female protagonist. I loved your bear picture!! I appreciated your recommendation of A Man Called Ove. It was very popular and it was ages before I was able to borrow it from the library. I’m glad I read it. Another book by the same author I enjoyed was Britt Marie. You might like it also. As usual, so much in your post caught my attention. All those books you read! I looked for your Goodreads account but couldn’t find it. Then I could stalk you and your reading! Love the duck. Me too–I might start petting him rather than listening seriously. I’ll send you an invite or whatever it is you’re supposed to do with Goodreads. I so don’t know this stuff! If I can’t figure it out, I’ll send you an email. After Molly’s comment above, I’m definitely going to start petting my duck. I did see a nutritionist years ago, but the real value for me came with my naturopathic doctor. He’s phenomenal. That said, I had one before that was a waste of time and money and I ended up getting quite ill under her care. So choosing wisely matters a lot. Oh and doctors generally dislike naturopaths, considering them quacks (duck joke – hah hah) so you’d probably have a better chance of getting a nutritionist through your doctor. Ooh I did conflate ‘nutritionist’ and ‘naturopathic’. I’ll have to ponder how to find a reliable one around here. Thanks, Karen. You have been distracted because you have been living at the beach. That, my friend, is the very best reason on the planet to be distracted and it is a good, good thing. Imagine if you went to the beach and weren’t distracted. What a waste of money and beauty that would be! I think the meditation work will eventually really help. You’re right that it’s probably helping a bit now, but I’m still not ‘really’ meditating – if meditating means experiencing even a few seconds of not thinking. I think I’ve had that experience twice in the last month. Sigh. But I will get there. The ‘shut the duck up’ statement came from an anonymous source that a friend passed along to me years ago. I’ve done some online searching and never been able to find it. ‘See’ you tomorrow for your post, Kathy. Looking forward to it. I was looking online at your symbols book last night (The Book of Symbols). Wanted to look at it when at your place but never got around to it. Would you recommend that one? It looks very useful as a reference. Finally, I don’t know about you and Joanne but I am somewhat drained (a very good form of exhaustion though) from last weekend. I realize once I got home again the “party” continued for me as it was my birthday weekend, but still! Looking forward to a long weekend of naps and other forms of rejuvenation! I’m feeling drained too! I’m glad you said that because I was feeling like quite the wimp for being drained after a day at the spa 🙂 But still – some kickback time this weekend will be so enjoyable. I’m glad I have The Book of Symbols. It’s a great reference guide, a beautiful book, and a good price given its quality. All that said, it’s very much a reference book so, like an encyclopedia, I don’t refer to it all that often. If you decide to buy it, great. If you aren’t sure and would like me to scan and send info for a few symbols just to see if it’s what you’re looking for, I’m super happy to do that. Thanks Karen. I think it would make a great reference guide for my artistic journey. I’ll probably pull the trigger soon – put it on my Amazon wishlist. I don’t think the spa drained me so much as all the great, deep conversations…hehehe! Ladies, you all look beautiful…what a wonderful time you must have had! Karen, I’m envious of how many books you read last month. I found myself in the same boat as Kathy (not literally–maybe then we could have helped each other out!) in that I felt distracted–more like scattered–and didn’t get as much done as I had hoped. Maybe if I had thought to tell my brain to shut the duck up! Love it 🙂 Happy August! Simply LOVE the duck… shut the duck up. LOL. What a great month you had… your road trip seems to be agreeing with you. I just started the Julia Cameron Memoir questions the other day… and also got stopped at 10 years old, wondering if I should pull out pictures to stimulate memories. I felt so bad that I had so few memories. Since I don’t think the exercise should be making me feel bad, I stopped for now. But I know I’ll want to start it up again. I did create a new vision board … but while I was targeting a longer range one, it ended up being more short term again. It’s intriguing that the core theme on it was grow. Not soar. There was a lot of grounding, being outside, nourishing. I’m wrapping my mind around this now. As always, I just love your RAW NEWS approach. And I’m not sure if I have baragnosis also or not. Unfortunately, I am not just shedding the weight like you. I can say that if I do gain a few pounds, I try and do better for a few days. So I yo-yo 5-7 pounds a lot. The amount of exercise doesn’t seem to impact it… just the amount of potato chips. So glad you had a fun spa day…and yes, I continue to be jealous of it! I can’t take credit for the ‘shut the duck up’ comment, but unfortunately have no idea who can. A friend gave me a sheet that included that phrase a bunch of years ago. There was no author listed and I’ve never been able to find a source, even after some pretty extensive Internet searching. I know what you mean about a scarcity of memories. I’ve got more once I was older and in school, but there are huge gaps. I’m finding that looking at report cards and photos helps, as does asking myself questions like – How old was I when I started my period and who told me about menstruation? When I was at my most boy crazy? How did my grade x teacher make me feel? What stories are evidence that I felt that way? Hmm, very interesting about the vision board showing the theme of ‘grow’. That feels to me as if it fits rather nicely with the Thai massage results you’ve been getting. Speaking of which, when I was at the spa with Deb and Joanne, I ended up having a Shiatsu massage which also emphasizes meridians. And guess what twinsie – gallbladder and liver are my problem too. We really must talk, Pat. Karen – thanks for sharing your July journey. It sounds like your metaphorical road trip is going well – so glad for you! As others have mentioned — your duck is adorable! Congrats on the weight loss, too! Thanks, Janet. My metaphorical road trip is laughable compared to your real mega road trip. I hope you’ve had a couple of days of not going anywhere that requires wheels and an engine. Wow you had quite an interesting and full month. I love reading your blog and look forward to your next one. Congrats on the weight loss. Well done. I did 365 days of meditating and was quite proud of myself for the commitment and how I felt while doing it. Mine was a guided 10 minute soothing and inspiring and peaceful 10 minutes of my morning. I have fallen off the wagon there. Time to get back at it! Thanks for the reminder. Cheers to August! Thanks so much, Glennis. A whole year of meditation? Wow! That’s quite the commitment. Isn’t it amazing that despite the consistency you demonstrated, it is still remarkably easy to fall off the wagon? Don’t beat yourself up though, Glennis. You’ll get back to it when you can. I saw that picture already on Joanne’s blog – what a wonderful time for you all! Yup. We only had a couple of pictures from that day and that was the best of the two so all three of us figured we’d use it. It was indeed a wonderful time! It’s always tricky to get a picture that everyone in a group is happy with! This one is great. Such a great July you had, Karen! Your road trip is agreeing with you. I like the bear picture and am glad you were inside. Spa day with friends is wonderful. Thanks for sharing your updates. Thanks, Natalie. My road trip is definitely agreeing with me. It’s a great feeling, much like your enjoyable summer so far. Hi Karen! What a wonderful July you had and good to know that you are still enjoying your metaphorical road trip! Your Shut the Duck Up! is great. Hopefully, you won’t have to tear it to shreds in order to silence your inner critic. You really are an interesting, generous, talented woman (who also looks fabulous, by the way) who doesn’t deserve to hear all that quacking. I loved A Man Called Ove too, and I second Fran’s recommendation of Britt Marie, by the same author. I’ll have to give Britt Marie a read very soon. Thanks for the recommendation. Wow! You have had a busy month Karen! As I was reading your RAW NEWS the word that came to mind was ‘simplexity’. Putting things in perspective and living right (I’m still figuring that out) all sounds so simple when I read your thoughts and all you have done but complexity comes when I try putting the ideas into practice in my own life; that’s definitely a work in progress!! 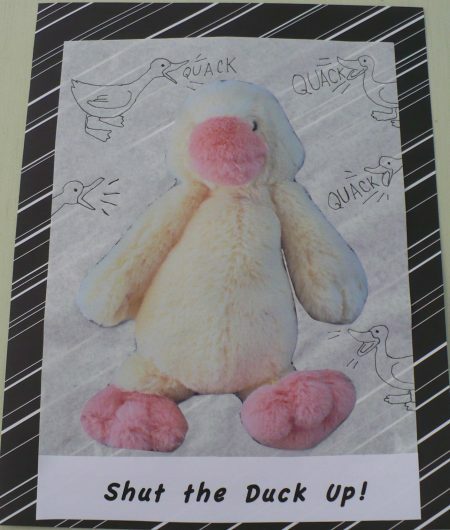 I’m so happy you have identified that shutting the duck up would be helpful, I can certainly relate. Congratulations on working through the challenge of weight loss, you are an inspiration. The spa time with friends I am envious of … so glad you could all enjoy it so much. I suspect August is going to be a great month for you, Karen. Congratulations on the weight loss, and realizing things weren’t “as bad” as you thought after eating a little bit of sugar. In regards to your writing endeavor, I think it is a really good thing that you have slowed down and are taking the chapters and tasks to an extra deep level. You are reaching so much – memories, potential, growth – by taking it more the way it feels right than by following the schedule or timeline of the book. And, how incredible you got to watch a bear safely from behind your windows. Did the dogs bark? The dogs were in my studio at the back of the house. I was so glad they weren’t outside. Shylah is nervous enough as is. I’d never get her outside again if she saw a bear. Thanks for the support about the writing. You’d know about this kind of writing better than most! Hi Karen, reading eleven books in a month sounds like heaven to me! I didn’t like the New Old Me Either. We just bought a different house and are in the process of moving so I am not getting much reading done! I am dreaming about this fall when I will finally have time to read again. I did finish Educated, by Tara Westover, which I really liked. It was my book club book so I managed to get it finished just as we closed on the house. 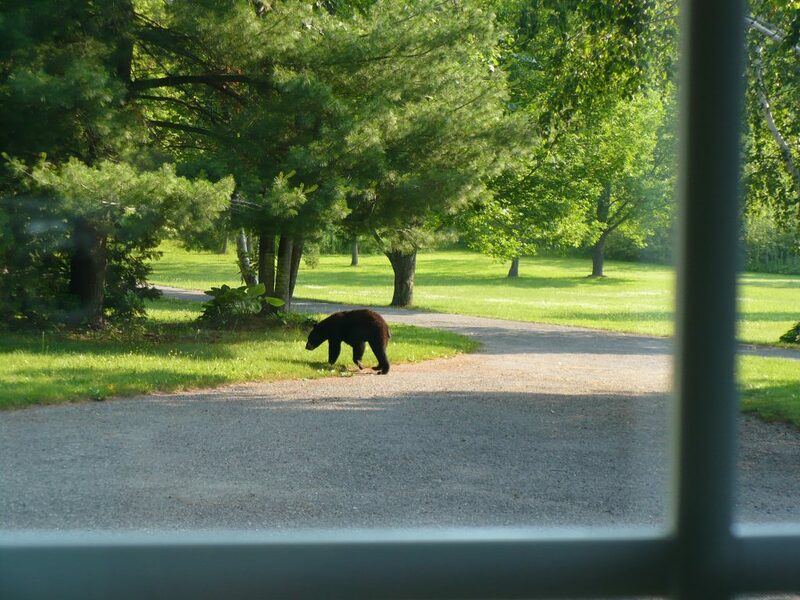 I’m glad you were not outside eating lunch when the bear decided to wander into your yard. Yikes! Good to get your perspective on Educated. It’s the next book in my ‘to read’ stack. I hope your move is going well. Karen, I have had a crazy summer with scarcely a moment to blog or to read blogs. However, I recently joined a book club, and have managed to do some reading. Like Michele, I recently read “Educated” by Tara Westhover, and I am considering recommending it to my book club. I also just finished reading “A Man Called Ove” by Fredrik Backman. Although it came to me highly recommended, and although the story had interesting aspects, I was somewhat disappointed with it. What I did not like about it was the ironic (almost supercilious) tone to the writing. What I did find intriguing was the backhanded way that the author introduced facts about Ove’s life, which mirrored Ove’s taciturn character. I have also read “Lincoln in the Bardo” and “A Spool Of Blue Thread”, both of which I liked very much, and “H is for Hawk,” which is a fascinating, complex book, but a somewhat difficult read. ‘Educated’ is still on my shelf, waiting to be read. Times have certainly changed. I used to devour anything that even hinted of education. I did enjoy ‘Ove’ but completely understand what you mean about the ironic tone. It took me a while to get past that. I haven’t read any of the last three you mentioned. I’ll probably skip ‘H is for Hawk’ – not interested in complex and difficult right now, but I’m looking forward to reading the other two.